No, that isn't the latest viral meme on the Internet. It's actually a practical consideration that could arise in orthodontics. In this case, the “something” to gain is a straighter, more attractive smile; the “something” you may have to part with is a few teeth. This may be necessary if there are too many teeth on a dental arch for its capacity, a situation called crowding. A lack of space is the main reason teeth come in misaligned. Before we can correct this, we'll need to free up space to allow for tooth movement by removing one or more of the existing teeth. The ideal candidates are those that are near to the teeth we wish to move but not highly visible. The first bicuspids are the most frequent choices for removal: they're located behind the cuspids or eyeteeth (the pointed teeth right under the eyes). Ideally, we'll remove the target teeth some time before we apply braces to give the gums a chance to heal. At the same time we want to preserve the bone that once supported the teeth we've extracted. This is because when we chew the forces generated by the teeth stimulates bone replacement growth. When a tooth is no longer there the supporting bone doesn't receive this stimulation and may ultimately reduce in volume. We may try to prevent this by placing a bone graft in the empty socket immediately after removing the tooth. The graft serves as a scaffold to encourage new bone to grow. Hopefully when we're ready to apply braces, the bone will be strong and healthy to handle the movement of the teeth. 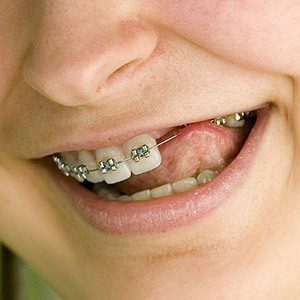 As the teeth move under the influence of braces, they'll begin to fill up the space created by tooth removal. Once it's completed, the extracted teeth won't be missed — the other teeth now straightened will completely fill out the smile. The different steps in this process must be carefully planned and executed precisely, and it will take months or even years to complete. In the end, though, this complicated bite problem can be corrected and replaced with an attractive, straight smile.